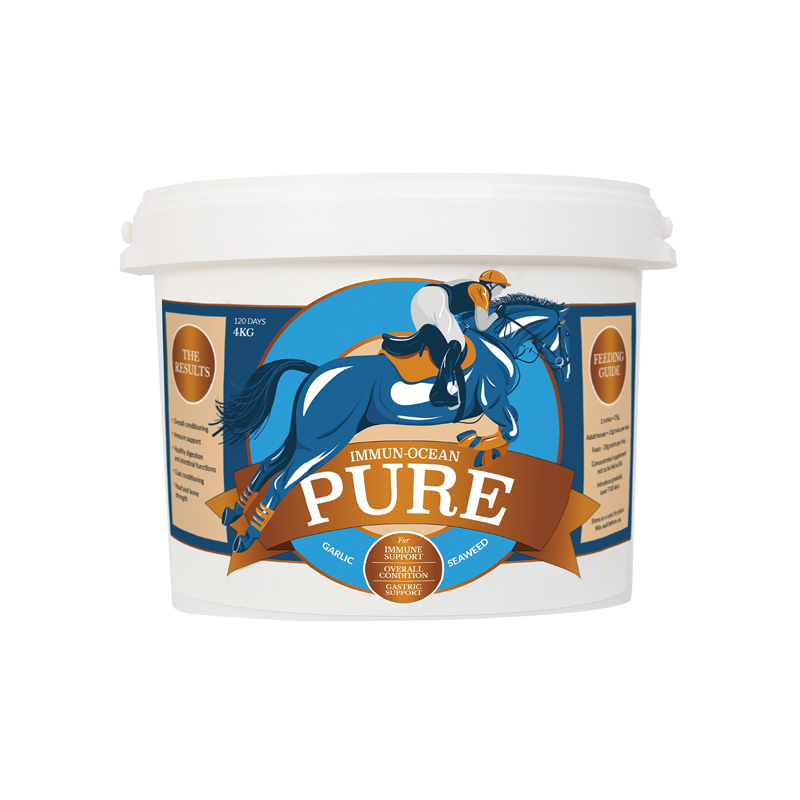 Immun-Ocean Pure is a vitamin and mineral-rich Ascophyllum seaweed and garlic supplement, specially formulated for horses. It provides a balanced blend of vital nutrients, which help maintain all-round optimum health and support the immune system. It also promotes good quality hoof growth and a healthy skin and coat. This supplement is 100% natural and contains a balanced mix of chelated minerals, vitamins, amino acids and antioxidants that help to promote a healthy immune system and aid the overall wellbeing of the horse. Available, in powder form, in 1kg and 4kg tubs. Feeding Instructions: Feed 15g twice a day and introduce it gradually. Chopped cold processed Ascophyllum nodosum, Copper 1.3 mg/kg, Iodine 421.0 mg/kg, Lead 0.5 mg/kg, Magnesium 0.8 %, Molybdenum 1.1 mg/kg, Nitrogen 1.1 %, Phosphorous 503.0mg/kg, Potassium 2.4 %, Selenium <0.2 mg/kg, Zinc 29.0 mg/kg, General Analyses, Dry Matter Content 90,0%, Total Protein 6,0%, Total Fat 3,0%, Total Carbohydrate 65,0%, Ash Content 17.5%, Phenols/Polyphenols.